Beyond the borders of civilization, beyond the influence of manipulating politicians, greedy merchants, iron handed clergy, and the broken masses that toil for their benefit, ancient ruins call to those bold enough,and desperate enough, to escape the oppression of mundane life. Treasure and glory await those courageous enough to wrest it from the darkness. But the danger is great, for lurking in the forgotten shadows are forces far more corrupt than even civilization. The price of freedom might be paid in souls. 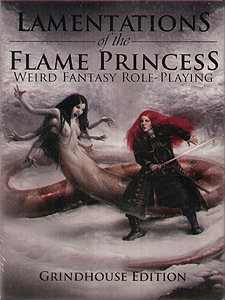 Lamentations of the Flame Princess: Weird Fantasy Role Playing presents a sinister and horrific twist on traditional fantasy gaming and provides you with all the tools needed to create and run a long lasting campaign tailored to your specific vision. Simple enough for a beginner with tutorial material included for those that have never before played a role playing game - yet meaty enough for the veteran, this is a complete game in one box. The Grindhouse Edition includes never before-seen spells, magic items, and introductory adventure, as well as a revised layout and over 100 new pieces of fantastic art that will transport you into the nightmare world of Lamentations of the Flame Princess: Weird Fantasy Role Playing.